McKnight57: Whaddaya mean I don’t get to wear a Batman cape?! Blue Blazer: Be honest. Does this shroud make me look fat? Knighthawk: My GOD man! I don’t have a nose and that stinks! Watson Bradshaw: No, my eyes are red because I AM part medical marijuana! TheNate: It’s curtains for you – and drapes for me! Twiggyseed: What did the Joker do to me? Oh well, at least Robin’s oka-…Robin? Watson Bradshaw: FOR GOD SAKE, CLOSE YOUR ROBE MAN! And your overall winner is ... Waston Bradshaw! I thought the dialog perfectly fit the look of horror on Swamp Thing's face and the casual, open stance of the random zombie swamp dweller. I almost went with Joel's "Legion of Doom" line instead, but ultimately decided that since Swamp Thing was never in the Legion of Doom I had to pass. Good job everyone, and congratulations again to Watson! Let me know what you'd like for your prize and I'll get it on The List. 7 Responses to Caption Contest 104 Winner! Good job Waston!That was close, but very well played. Congrats Watson! A very fitting line. 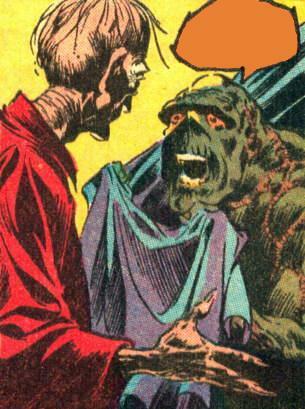 Thanks jeff, I am glad that the idea of swamp thing getting flashed got you laughing! For my prize I would like to add a tardis console or cockpit control panel to backgrounds. I feel it needs some more sci-fi interior elements, hope that is alright? This is pretty cool. Didn’t expect to actually be featured.